Assuming a cryptographically strong cyclic group G of prime order q and a random hash function H, we show that ElGamal encryption with an added Schnorr signature is secure against the adaptive chosen ciphertext attack, in which an attacker can freely use a decryption oracle except for the target ciphertext. We also prove security against the novel one-more-decyption attack. Our security proofs are in a new model, corresponding to a combination of two previously introduced models, the Random Oracle model and the Generic model. The security extends to the distributed threshold version of the scheme. 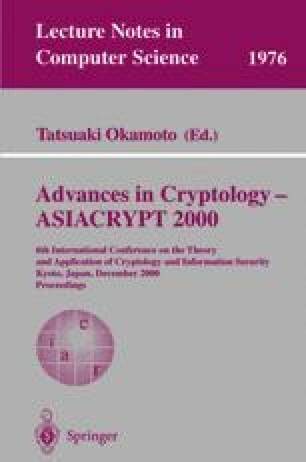 Moreover, we propose a very practical scheme for private information retrieval that is based on blind decryption of ElGamal ciphertexts.